I have to admit, I was really hesitant to tackle an entire solar system for living in a van. Not only was this just completely out of my element, but it required a lot of research and learning. I was certainly up for the task and once I figured everything out, I was just baffled at how this tiny house can run completely on the power of the sun. Remember, I'm not a professional electrician and these are just a few of my suggestions in order to get your solar setup up and running. My goal was to power my refrigerator, induction cooktop, 24" television, charge my laptop, phone, and other miscellaneous items, and provide an outlet in case I needed some other things. Click on the photos to check prices for each item. I have to admit, this inverter was a last minute decision for me. I originally ordered a 3000W inverter with 6000W surge protection. After it was sucking up my battery power by just being on, I realized that I didn't need a 3000W inverter and a 1500W would do the trick. This 1500W solar inverter is everything I need and more and was incredibly simple to install. We used these batteries in our RV setup that we had and could not be happier with the result. These 100aH 12 V AGM Deep Cycle batteries come at a very low price point, plus they are durable and extremely reliable. I ordered four in total, which may seem unnecessary to some, but so far my batteries rarely get below 85% with all my usage, which to me is worth investing in the extra back ups just in case. I daisy-chained them together in parallel which means I have 400aH at 12V, theoretically meaning about 200aH to use. The 2AWG Red & Black pure copper wire is used in the solar setup to daisy chain the batteries together. 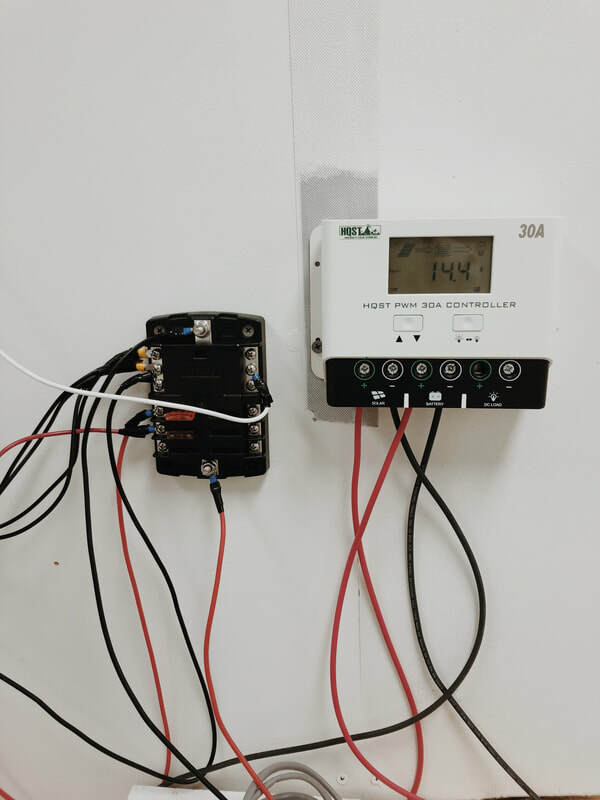 The inverter came with two proper wires already, so all I needed was to chain the batteries together in order to set up the AGM batteries with the inverter. It took me a long time to decide on the right solar panels because I have limited space on my roof. With the two skylights installed, plus the Fantastic Fan, there was only two places where I could fit a solar panel and most were way too big. 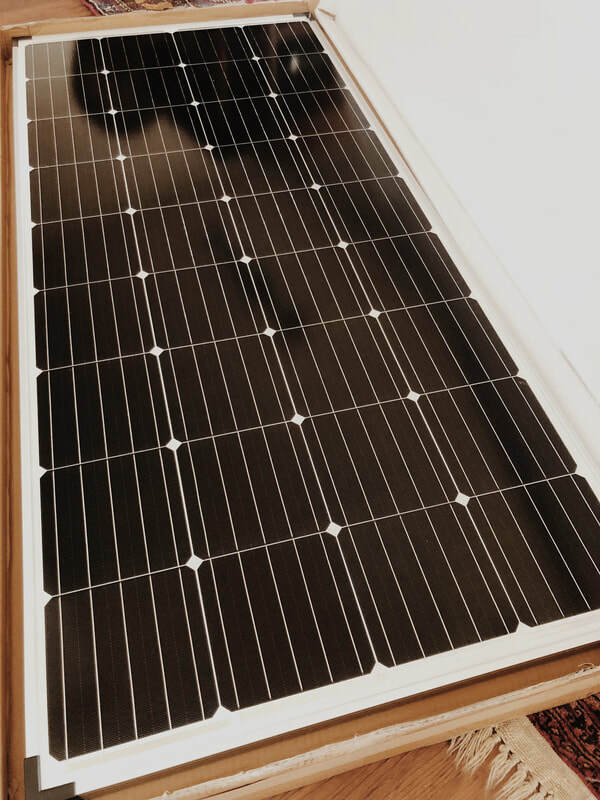 The Newpowa 175 W solar panel was the perfect fit, and in fact, I ordered two. With 350W on my roof I have no problem recharging my batteries when I need to. I'm going to be transparent with you...I wasn't 100% stoked about this 30 Amp charge controller. The ONLY reason being, the terminals where you connect the batteries and solar panels are really finicky and it took us a long time to get situated. In fact, we turned it over and took it apart in order to get everything right on the inside before we reconnected everything. With that said, after situating the connection ports, it works like a damn dream. Vanessa makes fun of me all the time because of my love for 3M VHB tape. But here's the thing....it's amazing. VHB stands for Very High Bond, which means that once it bonds to a surface it is pretty much guaranteed to hold. We used this on our RV to secure our solar panels to the roof because we did not trust that putting holes in our roof. I adhered my solar panels to the van with this tape and it has been wonderful. I have no concerns with the holding power of this tape. With three ports on the van light switch panel I have two sets of ceiling lights hooked up to each, plus my water pump across the room. It also comes with USB ports and a 12V plug port which means I can charge my phone or other USB devices straight from the switch. Simple, inexpensive, and very versatile. Blue Sea Systems makes quality fuse blocks and I am very impressed with this one. It is low cost, has more than enough ports to fit my needs, plus it has a negative bus bar already installed which ended up saving me about $15 an added headache of adding a bus bar. I needed a wire connector kit for my wiring and this one did the trick. It has over 200 pieces for all different sizes and styles of wire, and the variety really made setting up the electrical much simpler in the long run. 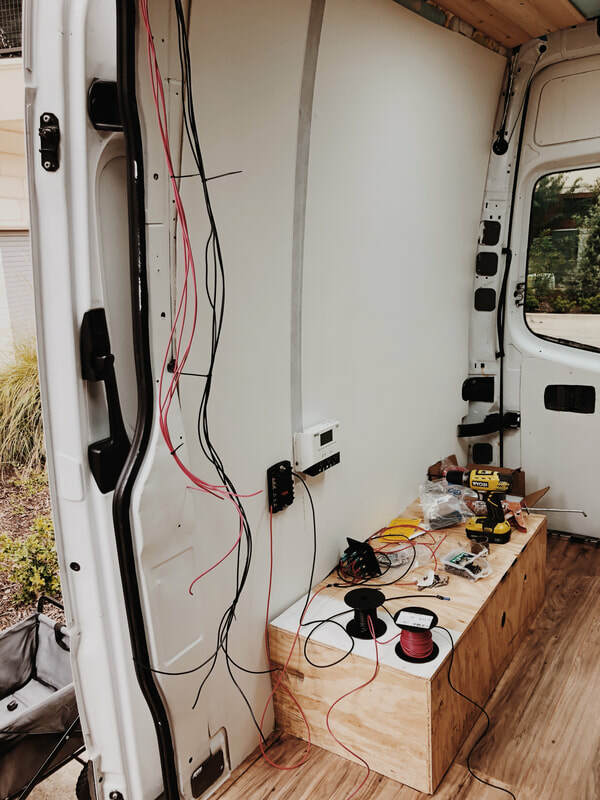 These Acegoo recessed van lights seem to be all the rage within the van community, and once you install them you'll understand why. There is an extremely low draw on electricity when using these and I decided to wire them in pairs rather than four at once. This was a decision I made because I didn't want to install a dimmer, but also wanted to position the lights strategically so that two are over the kitchen and two are over the table. I would highly recommend a pack or two for your build. I referenced a ton of different resources online when I was setting up my solar system because my experience was really limited. I had some knowledge of when we added a separate solar system to our RV, but I really wanted to dive into this and make it as reliable as possible. With 350W on the roof and 400aH in battery down below I can safely say that I am not concerned with running out of juice. My fridge runs constantly 24/7 without issue, plus my Fantastic Fan can be kept on for hours with no problem at all. For those who are setting up solar for the first time, I can recommend going online and roaming through Pinterest to find out what works for others. Using a solar calculator also helped me tremendously to gauge what I wanted to power and what I needed in terms of a solar setup for living in a van comfortably.